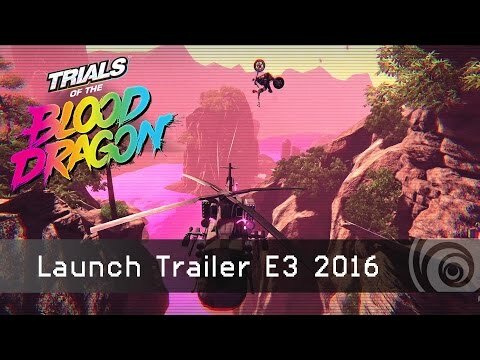 Trials of the Blood Dragon - Buy and download the game here! NOTICE: Activation key must be used on a valid Uplay account, requires internet connection. The activation key only works in Europe, Oceania, Middle-East, Africa, Asia (including Japan & South Korea // excluding Russia, CIS countries and Mainland China). In a world where Blood Dragons, beasts of unknown origin, roam free. In a time where the future is not what it used to be, there's a man. Discover an epic single player experience with the unique combination of competitive, precise, physics-based Trials gameplay- and rather less precise gun toting, balls swinging, neon-drenched Blood Dragon action. Journey through a colorful story with warzones in Vietnam, settling scores in Miami, confronting TV heroes in Tokyo and the odd detour into Space. Hell, you’re gonna go to Hell and back. The future is back. Are you ready?